What Are Nail Psoriasis Causes and Risk Factors? What Are Nail Psoriasis Symptoms and Signs? When Should Someone Seek Medical Care for Nail Psoriasis? What Exams and Tests Do Doctors Use to Diagnose Nail Psoriasis? What Types of Specialists Treat Nail Psoriasis? What Is the Treatment for Nail Psoriasis? Are There Home Remedies for Nail Psoriasis? What Are Medical Treatments for Nail Psoriasis? What Are Medications for Nail Psoriasis? When Is Surgery Needed for Nail Psoriasis? Is It Possible to Prevent Nail Psoriasis? What Is the Prognosis of Nail Psoriasis? Where Can Patients Find Support for Nail Psoriasis? Where Can Patients Find More Information on Nail Psoriasis? Psoriasis is a common chronic skin condition. A person with psoriasis typically has patches of raised, red skin with silvery scales. The affected skin may look shiny and red or even have pustules, depending on the type of psoriasis. These skin changes usually occur on the elbows, knees, scalp, and trunk. In the United States, over 3% of people have psoriasis. Psoriasis can also affect the fingernails and toenails, leading to thick fingernails with pitting, ridges in the nails, nail lifting away from the nail bed, and irregular contour of the nail. Most people with psoriasis of the nails also have skin psoriasis (cutaneous psoriasis). Only 5% of people with psoriasis of the nails do not have skin psoriasis. In those with skin psoriasis, 10%-55% have psoriasis of the nails (also called psoriatic nail disease), but it has been estimated that up to 80% of people with psoriasis will have nail involvement at some point in their lifetime. About 10%-20% of people who have skin psoriasis also have psoriatic arthritis, a specific inflammatory joint condition in which people have symptoms of both arthritis and psoriasis. Of people with psoriatic arthritis, 53%-86% have affected nails, often with pitting. Untreated severe nail psoriasis can lead to functional and social problems. Psoriasis is not contagious. How psoriasis of the nails develops is not completely known. Nail involvement appears to result from a combination of genetic (inherited), immunologic, and environmental factors. Psoriasis tends to run in families. About 40% of people with psoriasis have a first-degree relative who is known to have the condition. If both parents have psoriasis, a person's risk is up to 75%. Males and females are equally likely to have psoriasis. Psoriasis can occur in people of all races. Usually, people who have nail psoriasis also have skin symptoms, too. If someone has psoriasis of the nails but does not have skin symptoms, the condition may be difficult for a doctor to diagnose, since the signs of psoriasis of the nails resemble those of fungal infection of the nails. It is important to inform the doctor if there is a family history of psoriasis. The nail unit is made up of a nail plate, nail bed, hyponychium, nail matrix, nail folds, cuticle, anchoring portion, and ends of the finger bones. See each of these structures in images 1-2. Clear yellow-red nail discoloring that looks like a drop of blood or oil under the nail plate: This is known as an oil drop or a salmon patch and is a sign of nail psoriasis. Little pits in the nails or pitting of the nail matrix. Pits develop when cells are lost from the nail's surface. Lines or furrows going across the nails (side to side rather than root to tip): These are medically known as Beau's lines of the nail. Thickening of the skin under the nail: The doctor may call this subungual hyperkeratosis. This can lead to loosening of the thickened nail. Loosening of the nail (nail lifting): This is medically referred to as onycholysis of the nail bed and nail hyponychium. The nail may develop a white area where it is separated from the skin underneath the nail. Onycholysis usually starts at the tip of the nail and extends toward the root. The nail bed (skin under the nail) may become infected. Crumbling of the nail: The crumbling nail can be brittle and weaken because the underlying structures are not healthy. Tiny black lines in the nail in tip-to-cuticle direction: These are called splinter hemorrhages or dilated tortuous capillaries in the dermal papillae. This occurs when the tiny capillaries in the tip of the fingers bleed between the nail and the skin under the nail. Redness of the pale arched area at the bottom of the nail: This is known as a spotted lunula. It occurs when the capillaries under the nail are congested. Arthritis of the fingers with nail changes: The nails are affected in 53%-86% of people who have psoriatic arthritis. Nail psoriasis can also occur together with fungal infections of the nail (onychomycosis) and inflammation of the skin around the edges of the nail (paronychia). If there are changes in the nails such as discoloration (white spots or yellowing areas) or pits or if the nails seem infected or are painful, see a doctor. If a person has known psoriasis and has characteristic changes of the nails, the diagnosis is typically apparent. In some situations, the doctor may take a biopsy (a small sample) of the skin under the nail to determine if someone has psoriasis of the nail. The Nail Psoriasis Severity Index (NAPSI) was recently developed as a way to quantify involvement of the nails affected by psoriasis. This scale is most commonly used to measure the degree to which nails are affected in order to test the effectiveness of treatments or experimental treatments. Using the NAPSI, the nail is divided into quadrants, each of which is rated with a 0 or 1, based on the absence or presence of characteristic signs resulting from involvement of both the nail matrix and the nail bed. Therefore, NAPSI scores range from 0 to 8 for one nail and 0 to 160 for 20 nails. A number of different specialists may be involved in the care of people with nail psoriasis, including internal-medicine specialists, dermatologists, rheumatologists, primary-care specialists, family practitioners, or surgeons. At present, psoriatic nail disease does not have a cure. The goal of treatment is to improve the function and appearance of psoriatic nails. If the nails have a fungal infection, a doctor will prescribe an antifungal medication. There are no home remedies to cure nail psoriasis. In areas where the nail has loosened, gently trim the nail back to the skin where it is connected. This will allow medications to work better. All nail care must be very gentle. Vigorous nail care and attempts to remove debris beneath the nails can cause psoriasis to flare and worsen. Attempt to avoid injuring the nails so that the nail doesn't loosen more and so that the area doesn't become infected. Nail polish is safe to use and can hide discoloration. It may also help to reduce the appearance of surface irregularities. Nail polish should be removed before medical examination of the nails. A doctor may recommend that a part of the nail be removed, either chemically or surgically. Chemical removal of the nail involves putting an ointment on the nails for seven days. The nail comes off by itself with no bleeding. Even with effective treatment, an improvement in symptoms may take a long time, since eight to 12 months can be needed to generate a new fingernail. Steroids can applied to the skin under the nail or cortisone injections may be given under the nail; injection under the nail may be more effective than when steroids are applied in cream or ointment form. PUVA: This therapy is a combination of the prescription medicine, psoralen, and exposure to UVA ultraviolet light. Systemic therapy may be appropriate if you have both skin and arthritis symptoms or if the skin and nail symptoms are severe or persisting. Systemic therapy is medication that spreads throughout the body. It is often in pill or injectable form, including methotrexate or cyclosporine (or ciclosporin) tablets, and the injectable biologics etanercept (Enbrel), adalimumab (Humira), ixekizumab (Taltz), secukinumab (Cosentyx), and ustekinumab (Stelara) as well as infusible infliximab (Remicade). An oral medication for both plaque psoriasis and psoriatic arthritis is apremilast (Otezla). See the article Understanding Psoriasis Medications for more information. If other treatments don't work, a doctor can surgically remove the nail. The area is numbed with a local anesthetic before the nail is removed. Psoriasis is strongly influenced by inherited genes, and prevention of psoriasis is not possible. However, to help prevent flares and involvement of the nails, keep the nails dry and protect them from damage. Nail psoriasis does not have a cure, but the treatments mentioned above may improve the appearance and function of the nails. Education is one of the foundations for managing this chronic and typically relapsing disorder. People with psoriasis should be familiar with the treatment options in order to make proper informed decisions about therapy. The National Psoriasis Foundation is an excellent organization that provides support to people with psoriasis. Media file 1: Anatomy of the nail, view from top. 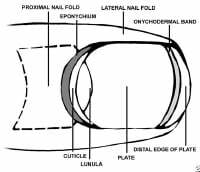 Media file 2: Anatomy of the nail, side view. Media file 3: Nail psoriasis with nail loosening. Image courtesy of Hon Pak, MD. Media file 4: Nail psoriasis of the fingernails and toenails. Note discoloration. Image courtesy of Hon Pak, MD. Media file 5: Nail psoriasis with pitting. Image courtesy of Hon Pak, MD. Media file 6: Nail psoriasis with joint involvement. Since psoriasis is incurable, the selection of treatment plans must consider the long-term outlook. Treatment options depend on the extent and severity as well as the emotional response to the disease. They include topical agents (drugs applied to the skin), phototherapy (controlled exposure to ultraviolet light), and systemic agents (orally, intravenously, or percutaneously administered agents). All of these treatments may be used alone or in combination with one another. Gregoriou, Stamatis, et al. "Treatment Options for Nail Psoriasis." Expert Rev Dermatol 3.3 (2008): 339-344. <https://www.medscape.com/viewarticle/576850>. Li, Cindy. "Nail Psoriasis." Medscape.com. Jan. 22, 2015. <http://emedicine.medscape.com/article/1107949-overview>. Ortonne, J.P., R. Baran, M. Corvest, C. Schmitt, J.J. Voisard, and C. Taieb. "Development and validation of nail psoriasis quality of life scale (NPQ10)." J Eur Acad Dermatol Venereol 24 (2010): 22-27. United States. National Institute of Arthritis and Musculoskeletal and Skin Diseases. "Questions and Answers About Psoriasis." Oct. 2013. <http://www.niams.nih.gov/Health_Info/Psoriasis/default.asp>. What symptoms did you experience with your nail psoriasis? What treatment has been effective for your nail psoriasis?